Permanent waves are a great option for naturally straight hair. Perms give clients a chance to rock a more textured look long term - creating volume and movement they’ve never had. A basic perm wrap is a 9 section wrap where all base sections are horizontal, the same length and width of the perm rod. The first thing to consider hair type and condition of your clients hair. That will determine whether you use an Alkaline or Acid perm. Coarse hair, hair that is thick or resistant to process, normal virgin hair. Fine textured hair, damaged hair, chemically treated hair. 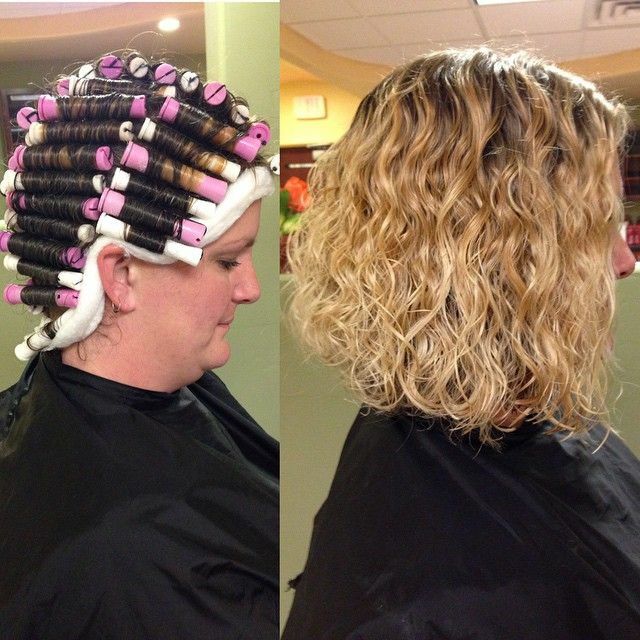 Once you’ve decided which perm is the best fit, consult with her on a desired result - then choose rod size. The smaller the rod, the tighter the curl. Shampoo hair with a clarifying shampoo to remove any excess oil or minerals. Rinse shampoo and DO NOT CONDITION. Remove tangles with a wide toothed comb or wet brush. Section hair into nine sections. To get things rolling, start at the top and center, creating a horizontal section the same size as your rod. Overdirect section and comb out with your rat tail comb. Apply end papers to the middle of section then place your fingers on either side of the end paper in a “cutting” motion, sliding the paper with your fingers to the end of the section. Once the end paper GOES PAST the ends, about ¼ inch, apply the rod. You can slide the end paper to make sure the very end of the hair is perfectly curled around the perm rod - then roll toward the face + fasten. Continue wrapping, then switch to rolling rods away from the face at crown. Once the middle section is done, move to the sides, wrapping the “middle” sections first - this prevents the hassle of trying to roll between two rows of rods. Protect your clients skin by using petroleum jelly around the hairline, applying to forehead, ears and beneath the hairline. Wrap a towel around her shoulders and remember the importance of protecting your client. Change wet towels often to keep her comfortable and prevents skin irritation. Open perm solution. Hand your client a towel to hold in case solution drips. Hold solution in one hand and a towel in other, applying solution to every rod - then apply perm cap. Check half way through timer + every 5 minutes after. When you see an “S” the perm is ready. Towel blot each rod with towels, then paper towels until moisture is removed. 5 minutes. Apply cotton to hairline + apply waving solution. Rinse 5 minutes + condition with a detangler. Educate your client, advising no washing / water for 48-72 hours.